This page is for booklets and brochures bound using wire stitches (like staples). These are ideal for magazines, catalogues, programmes and many other applications. Over many years, we've printed millions of brochures and there are very many more options available that are not on the web page, especially decorative effects like hot foiling, embossing and micro engraving. Have a chat with the helpdesk if what you want is not on this page. If you have a very large quantity, i.e. around 500 or more, it's worth checking the large quantity brochure printing. It takes longer and there are less options, but can save you money. Please note that not all sizes are available in Landscape orientation, though most are. We can also do custom sizes where technically possible, but these will cost more. Please have a chat with the helpdesk on 01452 751900 to discuss. Portrait means that the width is less than the height, landscape means that the width is greater than the height. Think of paintings on a wall, landscape paintings tend to be wider than they are tall, portraits tend to be narrower than they are tall. PP refers to a "Printed Page", so an 8PP A5 is eight printed sides of A5, i.e. 2 sheets of A4 printed both sides, stitched (read "stapled", only print finishers would know or care about the difference) in the middle, folded and trimmed. If you need something that's not offered here, please call the helpdesk on 01452 751900 to discuss. Please remember that the thicker the booklet, the more difficult it is to lay perfectly flat. Imagine you have taken the staples out of the booklet; you can see that the cover is one sheet of paper or card, folded in the middle. One side of the sheet is the outside of the front and rear cover - this can be printed full colour, or B&W (Black & White). The other side side of the sheet is the inside of the front and rear cover - this can be printed full colour, or B&W, or left blank (if blank, select B&W for a slightly cheaper price). For the purposes of this calculator, the cover counts as 4PP ("Printed Pages")- whether or not the inside is left blank. See the help for "Pages" for details about what "PP" exactly means. We always encourage new customers to get some samples before placing their order. Please call the helpdesk on 01452 751900 to arrange this. Please note that for technical reasons, not all paper types are available for A4 landscape orientation covers. The paper that is not available will be "greyed out" in the selection options. All paper is high quality and manufactured from responsibly managed and sustainable sources. We pre-crease all covers of 170gsm or heavier to ensure a perfect finish. Gloss paper is our most popular option, it has a semi-gloss coating. Silk paper has a semi-matt coating, very popular where you want minimal surface shine. Matt paper is a flat matt uncoated paper with a very smooth bright white finish. All papers can be written on with a ball point pen. Coated papers are not recommended for writing on with a fountain pen, select matt uncoated paper if this is an issue. If you want a cover that is heavier than the inner pages then we recommend that you select a minimum of 200gsm. A self cover booklet or brochure is one where the cover is on the same paper stock as the inner pages. These are very popular for newsletters, comics, and brochures or catalogs that are designed for short term use, i.e. for an event or promotion. We recommend that you don't specify covers of a lighter weight than the inners, but you can if you need to. 135gsm is a good standard weight for self-cover booklets or brochures, 170gsm is a "heavy paper" weight and is often specified for the inner pages of items that are designed to be kept and re-used, for example books or guides that are to be sold or kept as souvenirs. Lighter weight papers are still very good quality and are useful where you want to keep the weight down, or where higher pagination (thicker books) is required. As well giving you a higher quality appearance, having heavyweight covers gives a booklet or brochure greater durability. You should also consider lamination as this enhances the appearance and adds a great deal of durability. We hope these suggestions help, but please remember that you can order free samples that will show you the quality of the printing as well as the different paper types and weights. Just call the helpdesk on 01452 751900 to request samples. All enhance the appearance and increase the durability of the booklet or brochure. The soft touch laminate is a relatively new decorative effect. This is a matt finish and as the name suggests, feels soft. It's a very tactile finish, used for premium products. Please bear in mind that any colour at all counts as colour! Hardcopy. A hardcopy proof is printed and sent out to you via Royal Mail. This is printed on the paper you have specified but is not bound. Please bear in mind that this is in addition to the online soft proof, i.e. you will get both. Please don't approve the online proof before you have checked the hardcopy! These are working days to print. Our standard print service is 4 working days to print. You can pay a premium if you want your order on the faster 2 day to print service. Delivery is normally the next working day AFTER the job is printed & despatched by us. If you want a Saturday delivery, call the helpdesk to get that cost added to your order. We classify Monday-Friday as working days, Bank Holidays are not working days. Fill in the full postcode of where this is being sent to so that we can work out a price and whether we deliver to this area. You'll fill in the full delivery address later once you've placed your order. You must upload your file as a PDF. Please make sure that you read the artwork preparation guide before sending us your artwork. 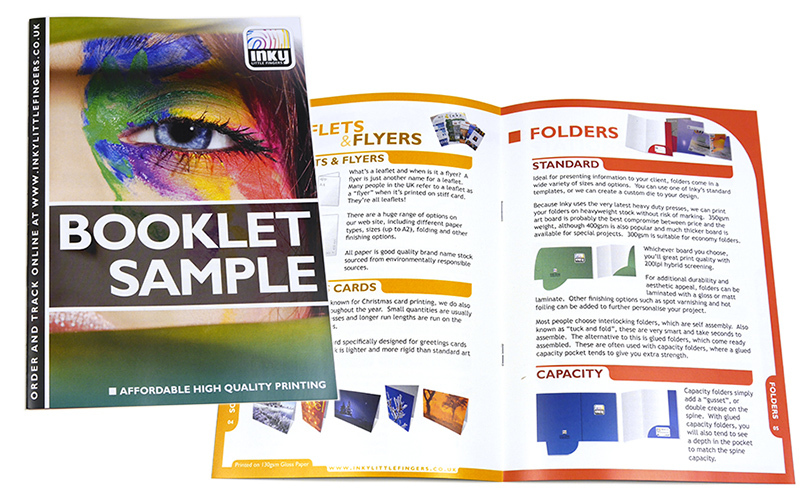 please switch to our litho printed brochures & booklets page for large quantities. Want a Different Type Of Binding? Inky has one of the most advanced binderies in the UK, so can manufacture nearly any type of high quality bound book or document you need. Just call the helpdesk for more information. Click here to read about the different types of bound documents we manufacture and what they are normally used for. Is This Good Quality Printing? This is not your local copy shop! We print brochures on the latest generation Heavy duty cycle production engines. The quality is superb. Why not ask for some free samples to see for yourself? If you input all of your details, this page will tell you if your booklet is too thick to make. If your booklet is thick, you should also consider alternative types of binding. All of the paper options offered on this page are on paper manufactured from responsibly managed and sustainable sources.